The OBJ file format is a simple data-format that represents 3D geometry which contains polygons defined as a list of vertices, and indices. Vertices are stored in a counter-clockwise order by default, making explicit declaration of face normal unnecessary. OBJ coordinates have no units, but OBJ files can contain scale information. 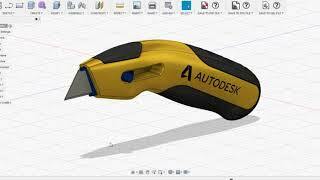 Create an obj file of your design in a moment and share it with anyone in one go. It will translate designs to a universally accepted format .obj. Fusion 3D models can be distributed to a third party without the need to have Fusion in their system. The trial version is valid for 15 days with complete functionality. The trial version is for testing the functionality of the plugin. After the trail has expired you will need to activate the product or purchase the PRO version from the store. Ans: Click on "Change Workspace" at top left corner and select "Model". Plugin will be displayed. 1. Solved issue related to unit conversion. 9. Pro: now also available as Pro version. Free version is now available as a trial for 15 days. 1. Create object file of your design. What's new 1. Missing entity issue solved. Past Versions History Version 5.0 1. Solved issue related to unit conversion. 2. Improved color accuracy. Version 2.0 1. Support of creating OBJ in different unit (Inch, Meter, CM, MM etc..) 2. Flip Axis to make OBJ compatible with other the system which has different co-ordinate system 3. Colors are more accurate to the original Fusion model 4. Choice of writing Normal in OBJ file 5. Progress meter to track the progress of OBJ model generation 6. Quality control: You can control quality and size of OBJ using settings dialog 7. Accuracy can be controlled from settings dialog 8. Hidden parts: Hide the parts which you don't want to have in OBJ file 9. Pro: now also available as Pro version. Free version is now available as a trial for 15 days. 10. Other minor bug fix Version 1.0 1. Create object file of your design. As a game artist this is so helpful!...now we just need an unwrapper and fusion will TAKE RULE!!! BRILLIANT AND SO NICE FROM THE DEV! Can we have another one for importing .obj? Such a nice and useful app. Thank you for making this free!